Thomas Jefferson was one of the most important political figures of American history. Born on April 13, 1743, he was a founding father of America, the creator of the Declaration of Independence, and the third president to serve the United States of America. He also founded the Democratic-Republican Party, as opposed to Alexander Hamilton’s Federalism. In addition to being the most important political leader of America, he also delved into the fields of arts, sciences and architecture. He is known for designing his own mansion, the Monticello, and the buildings of University of Virginia, which he had founded. He was a prolific writer, having written various books and thousands of letters in his lifetime. Philosophy was one of his many feats, as he served as a member and later as the president of the American Philosophical Society. He was a life-centered philosopher, as he closely observed and reflected on nature in all its forms: humans, geography, geology, plantations, populations and societies. Jefferson, being the principal classical liberal in America, authored the vital political doctrines in the Declaration of Independence, upon which the American Democracy stands today. As the third president of United States, he nearly doubled the expansion of America, readying the nation for launching it as a super power. Politically, Jefferson was highly influenced by Isaac Newton, John Locke, and Francis Bacon. He strongly believed in fulfilling the rights of all human beings. For Jefferson, the right form of government is the one which not only prohibits one individual from violating the right of liberty of the other, but itself does not breach the liberty of all its citizens. For Jefferson, love is similar a force to gravity: a source of attraction between two individuals. However, dependency taints the true nature of love, resulting in social and political problems. By eliminating the systems of dependency, such as banking or political influences, one can help in creating a just world, where all humans are treated equally. During his term as the third president of the United States, he worked greatly towards striking a balance of power shared between the states and the centre. He was in favor of granting greater power to the states, as he believed that rights of citizens especially that of liberty and freedom, can be fulfilled in a better manner in small harmonized societies. For Jefferson, democracy is a form of expression of the society. He called for self-determination, public education for the males, and a cultural uniformity of the nation in order to bring out the true feeling of democracy in America. He also emphasized on the freedom of media, alongside public education, as he thought that without knowledge and access to information, the nation will remain unsafe. Jefferson also strived for the separation of religion and the state. Personally, he had lost faith in the conventional religion, and derived his morals from classical literature. Politically, he was against the adoption of an official religion by the state, while he also championed the right of freedom of religion and association for all citizens. 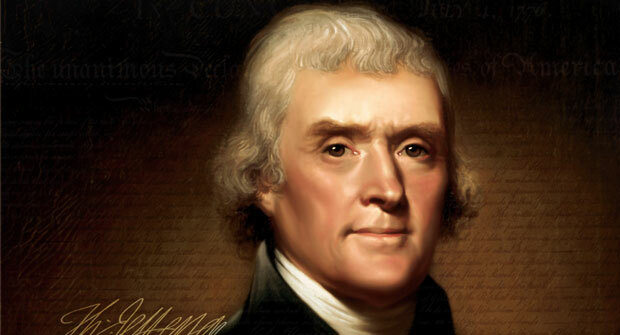 Thomas Jefferson is hailed as one of the most central persons behind the American Revolution. He died on July 4, 1826. He is regarded as the symbol of equality, liberty and the democratic rights of individuals, not just in America, but worldwide.